To make it easier next time, I have created a (quite colorful) chart and thought I'd share it. Anyway, I hope this is useful for someone. This is a slimmed down version of the above sheet. Just look for the survivor type or hero you need and it'll tell you exactly what mission they can be found in. 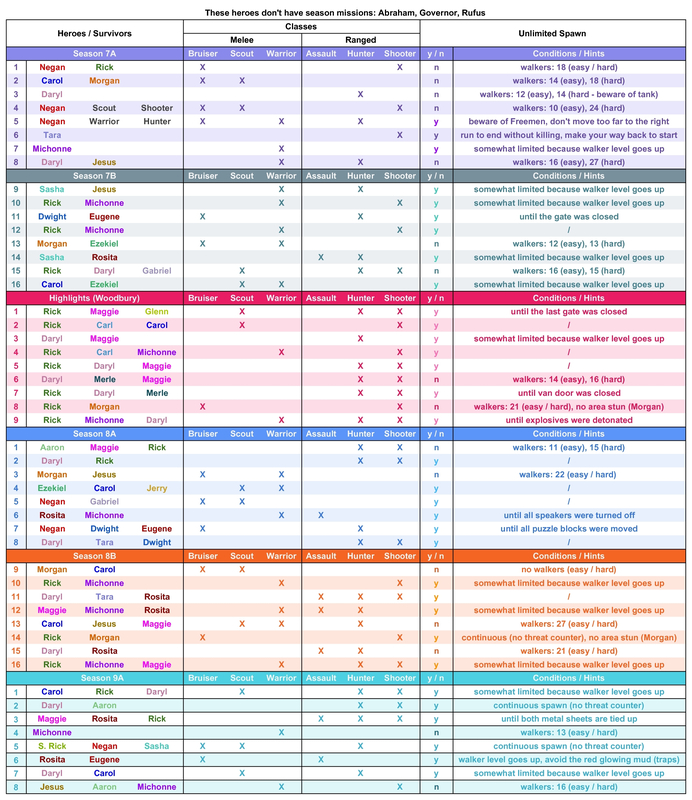 Updated my chart (corrected the mission numbers on season 8B) and added a "last updated" date - I will edit the first post after each new season mission. Updated the first post to add the newest season mission. Updated once more to add a hint to mission 7A - 7. Redownloaded and restating Thank You! You're welcome. Glad it's of use to someone. I'll keep updating this every week (or whenever there is something new to add or something to correct ). Great chart. Would be helpful to add a bottom row check for unlimited spawn and one for spawn timer. Would help me not to choose beach life for Tara. To @DLich's chart, I suppose? BTW - Updated mine to fix a small mistake. Yours are very helpful. Wish @DLich would add to his too. Will be using yours instead of his as that unlimited spawn is important to selecting a mission for dailies. 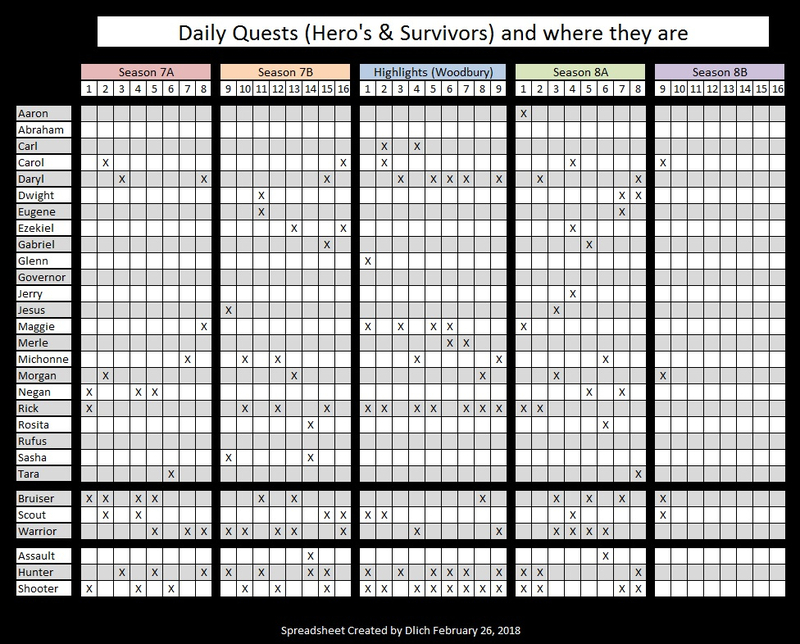 Maybe you can use his to quickly find in which mission each survivor or hero is and mine to see if there is unlimited spawn or not - if it is easier for you to find that on his chart. And maybe if @DLich wants to and finds some time, he will add a marker or row for unlimited spawn. 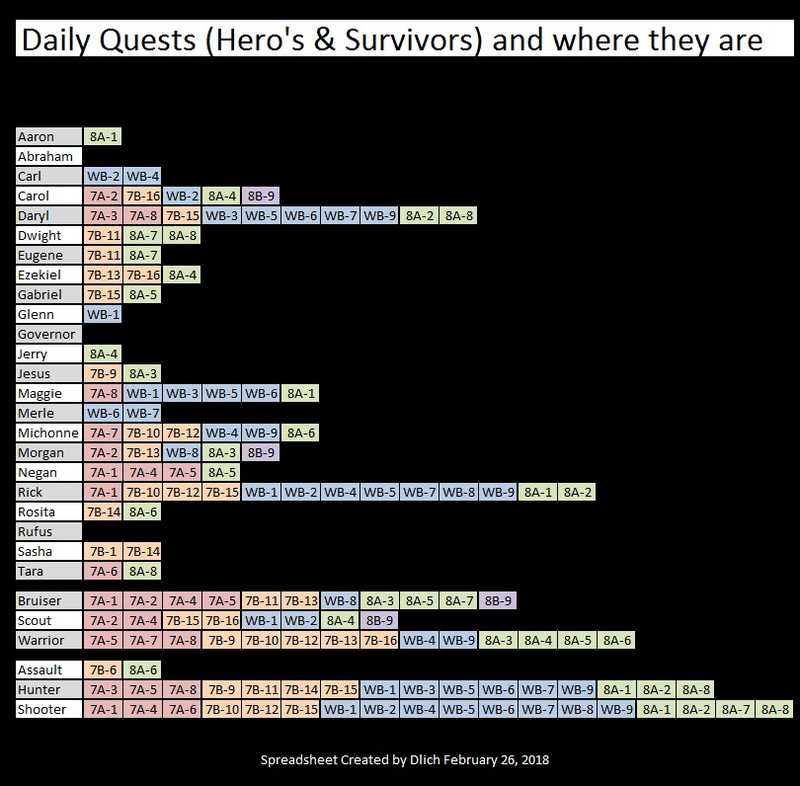 I really like his charts, too - I think they might be even easier to use than mine to find a certain hero or class. Wow @Jaden I thought the beach life with Tara and the one with negan and gab were the only one with endless spawns...do the others you posted increase difficulty with spawns like Rosita and Sasha? Going to update my chart in a bit. Tara beach does not have unlimited spawn - many others do, though, as you can see. Difficulty increases in the Michonne solo mission (7A - 7). Didn't notice it anywhere else but if I have missed it on some mission, let me know and I can add a hint. > Going to update my chart in a bit. > Tara beach does not have unlimited spawn - many others do, though, as you can see. > Difficulty increases in the Michonne solo mission (7A - 7). Didn't notice it anywhere else but if I have missed it on some mission, let me know and I can add a hint. There is a trick to making Season 7A - 6 an unlimited spawn. I created a video that shows the ‘limited’ and how to ‘unlimited’ it. Thanks, you two. That's a way of running the mission that I've never tried. Found a super quick way to finish it and knew some people were able to get a higher kill count but I never could kill more than what I've listed though I've tried several time. Not killing and running towards the exit just to turn back and run to the beginning again to get unlimited spawn is not really intuitive. I think the Gabe and Negan one isn't too bad if you run towards the door and let the spawn build up. It's quite quick that way. Most of the times I need specific types of survivors or a certain hero for the kill and sometimes that can be annoying if the spawns are slow/low - but it's cheap and free of risk. Today I needed to kill 30 walkers with a hunter and 30 walkers with Sasha - jackpot. 1 gas and the mission with Sasha and Jesus. A little slow but works. For kills with Tara I use the one with Dwight, Tara and Daryl because of the quick spawn. Might mix it up with Tara Beach now that I know how the unlimited spawn works. I would always also use beach life for the old achievement that was 30gold for complete mission without killing a walker. 100 kills with a scout or bruiser would be annoying. But most of the times it's 30 at max with a certain class or hero, so not as bad, and melee usually lower. I left that mission unfinished so I can use it for farming with assault/hunter. I also always used Beach Life for the "kill no walker" quest. Was really great for that. Updated to add the info given in this thread. And another small update: mission 7B - 16 is also somewhat limited because walker level goes up.